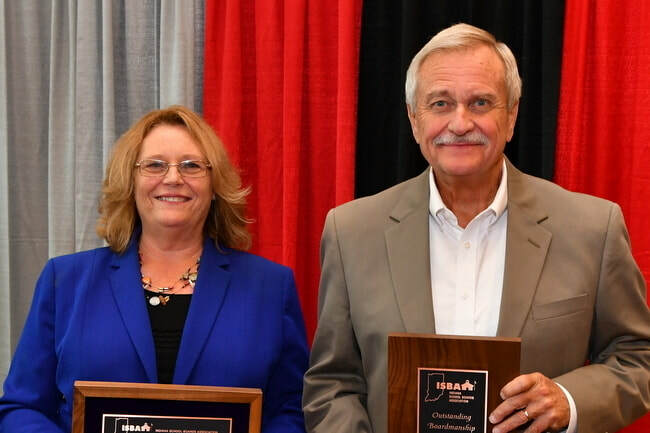 The ISBA Distinguished Service Award is presented to individuals who exhibit exemplary leadership and whose contributions have enhanced public education. This award recognizes its recipient as an individual who has performed honorably; provided support to their colleagues and educational affiliates; exhibited enduring service on behalf of public education; and, made significant contributions to the field of education by service, writings, presentations and other professional activities. Pictured above: 2018 Lorin A. Burt Award winner, Dr. Debra Howe (Tri-Creek) and 2018 Outstanding Boardsmanship Award winner, Bill Wilson (Clarksville). Dr. Lorin A. Burt, described as one of the nation’s outstanding young men in the field of education, served as executive secretary to the Indiana School Boards Association from 1960 to 1967. Following Dr. Burt’s death in 1968, a memorial award was devised to be given annually to an outstanding educator for “overall excellence in contributions to Indiana education.” To nominate an individual, please complete the Lorin A. Burt Award Application and submit to Michael Adamson, madamson@isba-ind.org. “Thinking about how to honor an outstanding board member who has accomplished an extra-ordinary deed for your school or community? Give this person the recognition he/she deserves by placing his/her name for nomination to the 2017 ISBA Outstanding Boardmanship Award.” To nominate an individual, please complete the Outstanding Boardmanship Award Application and submit to Michael Adamson, madamson@isba-ind.org.